Back in November last year, thanks to Heineken paying lots of money to have James Bond drink one of their beers in Skyfall, and also thanks to the lovely people at Food & Fuel, I won a £100 bar tab and a tour of the Moncada brewery. The bar tab was used mainly on drinking all the Punk IPA at Mel’s in Earlsfield, but due to Moncada having to relocate, the tour was only organised for a couple of weeks ago. And, as luck would have it, Shamblemoose were launching their brewery at The Union Tavern right around the corner from Moncada near Westbourne Park. How bloody fortuitous! My friend Steve and I arrived at the Union, were informed that there was a brewery launch that night, to which we replied, “That’s why we’re here!”. Whilst pulling our pints of Shamblemoose’s American Brown Ale No. 4, the barman remarked that people will do anything for free beer. Now I expected a taste, not a full pint! Great start to the evening. The beer was, well, brown. Strong biscuit malts, slightly spicy flavour with crackling autumnal hops. Nice. 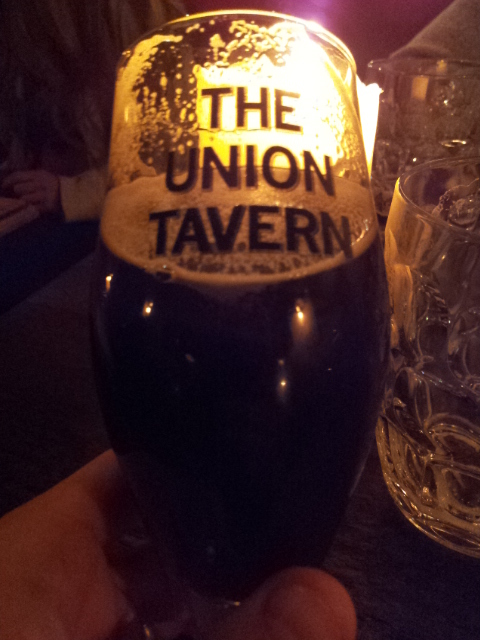 This was my first visit to the Union and their beer selection was impressive (over 6 hand pumps and about 10 keg taps, from memory) including lots of local London beers. After the Brown we had time for a half, so we took the economical decision and squeezed in a Brodie’s and Kernel Scanner Darkly collaboration Black IPA. As Steve pointed out, the nose was a big hit of blackcurrant. The taste was warm and roasted, with some hoppy zing and a nice, blackcurrant bitter finish. Very tasty. We then headed to Moncada where we met my friend Jamie, who was joining us on the tour. The door of the unmarked unit in the back streets of north west London was opened by Julio Moncada, the founder and head brewer. He was very welcoming and seemed very happy and keen to show us around his new premises. Moncada was founded by Julio in 2010 in premises around the corner, but he was forced to move a few months ago due to the building being demolished. Julio is originally from Argentina and moved to the UK about 10 years ago. His love of beer started here and he became an avid homebrewer. And then in 2010, together with 2 friends, he started Moncada. 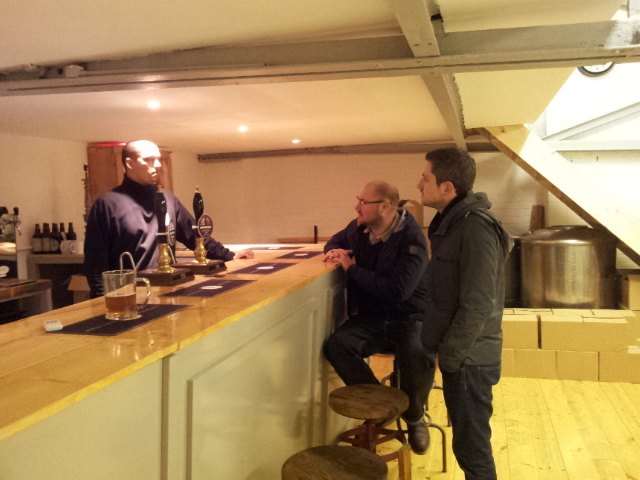 We were shown around the brewery, the lovely wooden-clad hot liquor tank, mash tun and kettle. 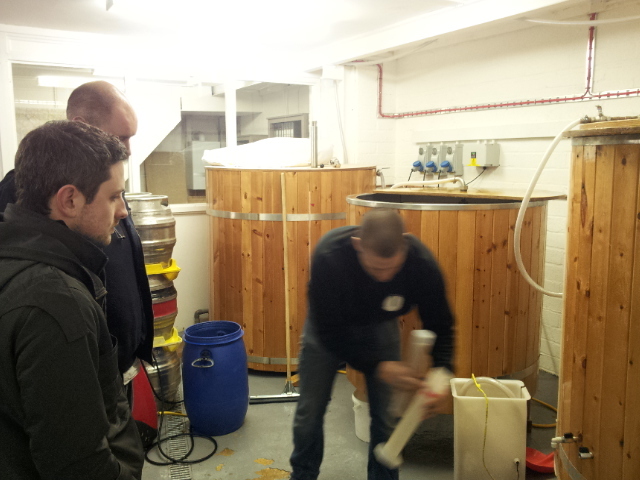 He talked through the brewing process, and his brewing beliefs. They don’t use any finings or chemicals at Moncada, they work with the water they have and their final beer is a little hazy but it’s unadulterated. He let us have a sniff and a taste of the 2 batches of Blonde in the fermenter – one brewed a few days before and one brewed that day – and showed us the cold store room full of casks and and extensive hop stock. Then we went upstairs to the Moncada bar, and we were priveleged to be the first outsiders to have a drink there. Julio lined up the bottles of their current roster, which all have the “Notting Hill” name: Stout, Porter, Ruby Rye, Amber, Bitter and their biggest seller, Blonde.The Porter was good, great for a winter evening by a fire. The Stout had a much fuller mouthfeel than the Porter, and much more roasty toasty flavours. But both of these felt a little too carbonated for my tastes. Then we went on to the Blonde from a chilled keg font behind the bar. That was really good, a touch of wheaty cloudiness, lots of fresh, crisp grassy hop notes on the nose and a smooth biscuity flavour. Perfect for a west London pub garden in the summer, and Jamie’s favourite. The Ruby Rye was possibly my favourite, the spicy rye taste backed up by toffee malts and a gentle hop zing. I’d like to try it on tap. And the Amber was also good, that’s Julio’s favourite. They have 6 beers on at any one time, the Blonde and the Amber being the only ones brewed year-round. We asked Julio lots of questions about homebrewing, and Julio was very helpful, offering lots of advice. He showed us their pilot kit that they’d recently bought – 3 big, shiny Blichmann pots – that were to be setup near the bar for small batches and for guests to learn about brewing. Then we climbed up to the loft and were shown where all the malts were stored, and tucked away at the back was Julio’s original homebrew setup on which most of the Moncada recipes were formulated. We then descended the stairs and congregated around the bar again. Next up was a bottle of last year’s Summer, which Julio thinks was best drunk young. It was light, quite fruity and quite drinkable, very much as you’d expect from a summer beer, but it wasn’t really suited to the near freezing temperatures outside. The beer will be revived for this summer, but they’re planning on dry hopping it to give it a little more impact. 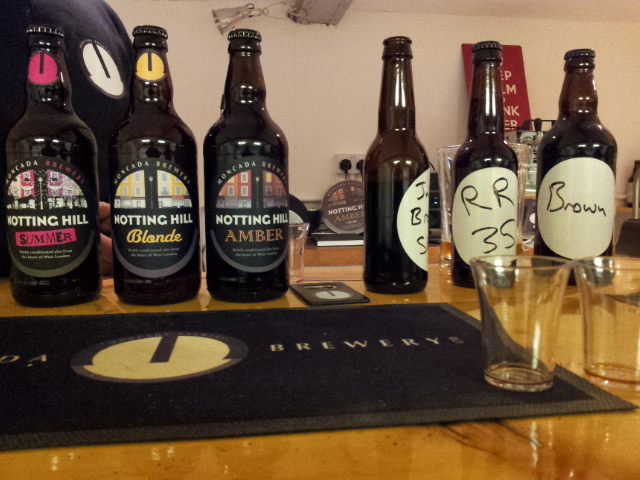 Then we moved onto the hand labelled bottles. These are small, experimental batches of new recipes that the brewers are trying. The Porter that they make is actually a mixture of two recipes that Julio and one of the other brewers put forward in an in-house competition. Julio let us try a bottle of his original recipe. And we had what was labelled as “Brown” which was a strong ale, a lovely, rich winter warmer. Full of toffee and caramel. Yummy! But I think my overall favourite beer of the night was the last one we tried, right at the bottom of the fridge, hand labelled “RR Dry Hopped”. I pointed it out to Julio and his eyes lit up. “I didn’t know we had any of this left!”. It was all the spicy, toffee flavours of the regular Ruby Rye with a big tangy, grapefuit hop slap. Gorgeous, just my kind of beer. We stayed quite late, and then realised that we all had a long way to go home, and were in Westbourne Park. So we said goodbye to Julio, thanked him very much for his time and hurried through the cold west London streets to the tube. A nice brewer, a good philosophy of beer and a great range make this a very interesting brewery. Try them if you see them.